I was put in charge of taking care of my grandson’s pet while he went on vacation. Pete the Parakeet was dropped off at my house while I was out. This is what I found when I came home. It is the most adorable thing I have ever seen, and I just has to share. It just makes you want to say “awww….” . Posted in Words of Wisdom and tagged adorable, Bird Sitting, birds, blog, grandmother, Grandmother Musings, grandson, love, musings, Pete the Parakeet, pets, postaday, vacation. Bookmark the permalink. Awwww! How cute! 😀 Hope Pete enjoys his holidays too! I don’t know how I missed this post. How cute! A few years back a friend of mine sent a picture of a found parakeet that some guy in her building found and was busying playing with the bird and taking pictures of it at his cubicle. It was hilarious. 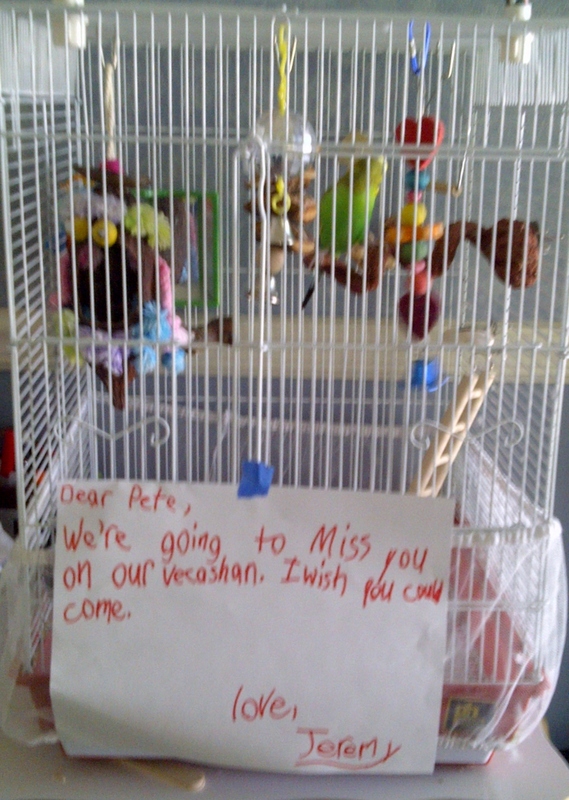 I subsequently cropped the picture so you could just see the bird and set up an email address for Petey Parakeet. I used clipart of hats and other things to dress up Petey for various holidays and sent her emails from Petey for Christmas, New Year’s and St. Patrick’s Day. When I saw that your grandson named his parakeet Pete, I giggled and thought about my fake parakeet.